How to Take Hot Backup without Rebooting Computer? A hot backup seems to be the most convenient way to backup data for it does not require downtime. With AOMEI Backupper, you can take hot backups just by a few clicks. What is a hot backup? In case of system crashes, hardware failures or deleting data by mistake, to backup system partition is crucial. There are primarily two types of backups. One is cold backup, performed when the database is offline, namely all the data is not accessible to the users while the backup is in process, the other is hot backup, a technique to perform the backup while system is running normally, even if the data to be backed up is being read, updated, or edited by the users. For those whose system must be running 24 hours a day, 7 days a week, whose data need to be updated frequently, or who run a multi-user system, a hot backup is best backup solution. Comparing hot backup and cold backup, you can find a hot backup more convenient in many ways. You may also know hot backup as a dynamic backup or active backup. AOMEI Backupper Standard, a backup freeware software, allows you to do system backup, partition backup, disk backup, and file backup. Powered by Windows Volume Shadow copy Service (VSS), Backupper is one of the best solutions for performing hot backups. It creates a snapshot when a backup is triggered, so the backup will be completed under the current system without going to DOS or WinPe, and the data being backed up is still accessible to users. However, it also means the changes you make while backing up won’t be included in the final version of the backup. How to perform a hot backup with Backupper? Backupper allows you to do system backup, disk backup, partition backup, and file backup. Let us see how to do a hot file backup for example. 1. You can choose system backup, disk backup, partition backup, and file backup. Let us see how to do a hot file backup as an example. Download this freeware, install and launch it. Then select one type of backups “File Backup” under “Backup” tab. 2. Click “Add File” to add the file(s) to be backed up, and edit the task name. If you also want to backup some folders, click”Add Folder” to add folder(s). After select the folder, you can set a filter to selectively backup the files. Wildcard character, which can be used to substitute for any other character or characters in a string, is also supported. Wildcards or wild characters are typically either an asterisk (*), which represents one or more characters or question mark (? ), which represents a single character. For example, the pattern “*12?” will match “123” or “000123”, but not “1234”. 3. After choosing folders or files, click “Step 2” to select a location as the destination path. Before start the backup, you can set a schedule automatic backup to run incremental or differential backup by clicking “Schedule Off”, and write a comment, set an email notification, compress, encrypt, or split the backup image under “Backup Options”. 4. Now, you can click “Start Backup” to perform the backup. In the next screen, you can see the backup is in process; in the meantime you can still use your computer or even edit the files being backed up. 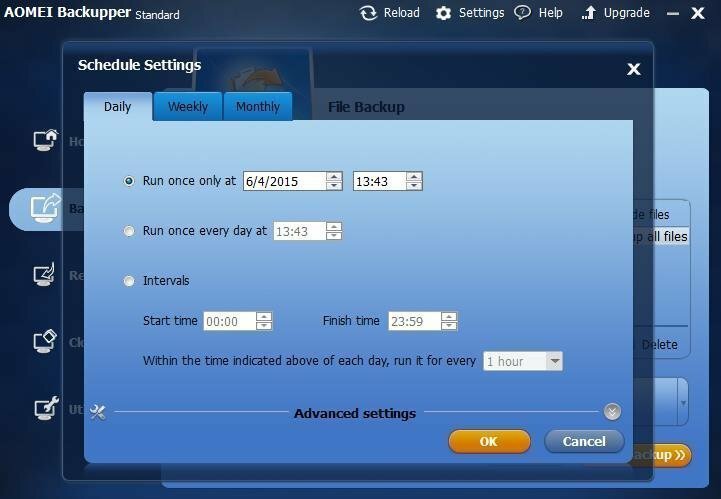 Restoring a hot backup is also exceedingly simple and convenient with Backupper. Selective file restore, which means selectively restore parts of the files as you like, Dissimilar Hardware Restore, and restore via a Bootable Media are also supported. Besides backup and restore, Backupper also providessystem clone, partition clone, and disk clone to make sure you data will never be on risk.